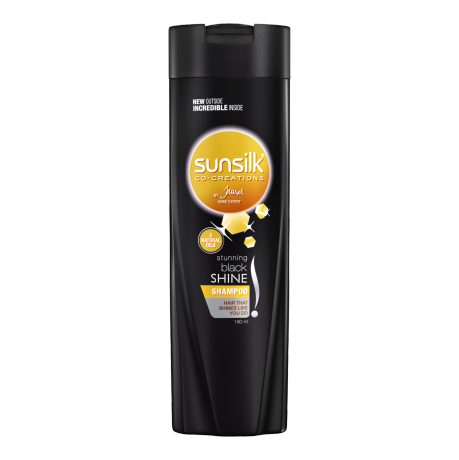 Sunsilk Stunning Black Shine shampoo 180ml - let your hair shine like you do! • With Sunsilk Stunning Black Shine get long lasting shine from day to night! • Enriched with five natural oils, this formula moisturizes and nourishes your black hair making it look fuller and shinier. • Prevents dullness and restores a healthy lustrous look. Sunsilk Stunning Black Shine shampoo is now New Outside & wow Inside. 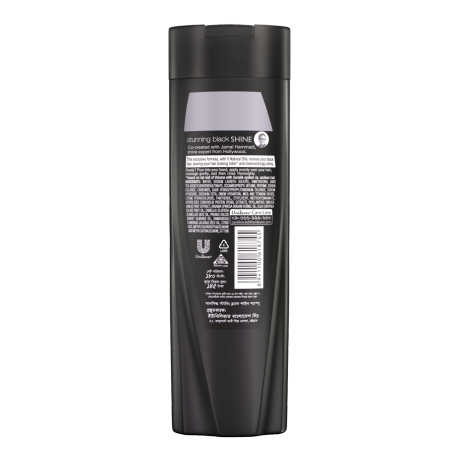 Its coolest black shampoo pack comes with an easy to handle grip and a wow inside as before. Sunsilk Black Shine is enriched with amla pearl complex. It nourishes hair, and works from the first wash, to give you shinier* hair. The sun needn’t ever set, on your shiny hair! Even on those really long work days, you can shine non-stop. Impress at that important presentation late evening, or let your lustrous hair down, at the official party, or with your BFFs. Either way, stay ready to shine, anytime with Sunsilk Stunning Black Shine that ensures long lasting shine, from day to night*.